Supply to different functions vary according to the type of signaling and type of equipments used . For example, signal heads may be fed at 110/12 V AC , 12 V DC or may be of LED type. etc are to be installed in the R/Rooms and field locations for signaling purpose. Besides, there may be items like Location lamps, heaters etc which are to be fed from the power source available in the location. Where production of designs for a new installation is involved, total power requirement may be calculated by taking the maximum possible load of each function in to consideration. For example, the maximum load of a four aspect signal, is taken as two lamps lit at a time (double yellow). The capacity of the feeding source (transformer, T/J etc) is arrived at by taking the load of all the equipments proposed to be connected to it. 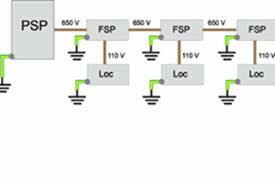 Arrive at the final figure of load by adding items 1 & 2 and check if the existing Transformer / T/J can meet the additional requirement. If the total final load does not exceed 90% of the capacity, the feeding equipment can be retained, and if not it stands for replacement. A typical Power Calculation sheet of EY1 R/R is provided for reference.